Citing individuals "familiar with the matter", the Wall Street Journal claims the Department of Justice is investigating Comcast for possible anti-trust violations. The DoJ has reportedly spoken to Netflix, Hulu, Comcast and others so far during their investigation. Comcast has been accused of abusing data caps in order to undermine third-party video streaming services. This probe follows last month's request by Senator Franken (D-MN) which called upon the DoJ to investigate Comcast for potentially violating guidelines set forth during its acquisition of NBC Universal. Those guidelines prohibit Comcast from "unreasonable discrimination" when it comes to the data and content served over its infrastructure, which is likely the real issue here. Xfinity, Comcast's $5/mo TV show and movie streaming service, is probably the investigation's creamy center. 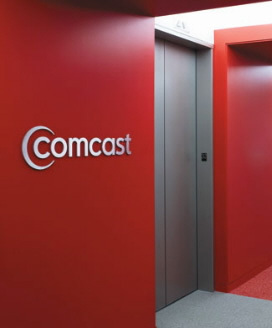 Although details concerning the probe are mostly unknown, Comcast was accused of playing favorites by allowing its own residential customers to stream Xfinity videos without the resulting bandwidth counting toward their monthly 250GB data cap. The cable company announced this feature in March, specifically for Xbox users who install Comcast's Xfinity app. Opponents of the Xfinity deal worry that Comcast subscribers may be afraid of reaching the imposed monthly limit by watching videos on Netflix, Hulu, YouTube and other services. As a result, such Comcast subscribers may be influenced to sign up for Xfinity without giving other video services a second thought. Comcast no longer following net neutrality principles. Comcast should apply caps equally, or not at all. I spent the weekend enjoying four good internet video apps on my Xbox: Netflix, HBO GO, Xfinity, and Hulu. When I watch video on my Xbox from three of these four apps, it counts against my Comcast internet cap. When I watch through Comcast’s Xfinity app, however, it does not count against my Comcast internet cap. Comcast reminded opponents that only Comcast cable television subscribers can sign up for Xfinity. The company argued that Xfinity is merely an extension of its own existing cable service which is streamed via the same IP-based network it uses for CATV Digital On Demand services. Additionally, as spelled out in their Xbox FAQ, Comcast says it treats the Xfinity Xbox app as a cable box, for all intents and purposes. Coincidentally, Comcast has since eased up on its 250GB per month bandwidth cap. The company said in May that it will ignore the policy until plans to test and roll out a friendlier 300GB soft cap come into play.